In a change to its Reuse and Recycling Program policies, Apple is now allowing customers to trade in devices that have been exposed to water or other liquids, though prices can be affected by over $100 in some cases. For its Reuse and Recycling Program, Apple has partnered with PowerON to buy used iPhones, iPads and Macs, as well as other non-Apple products. 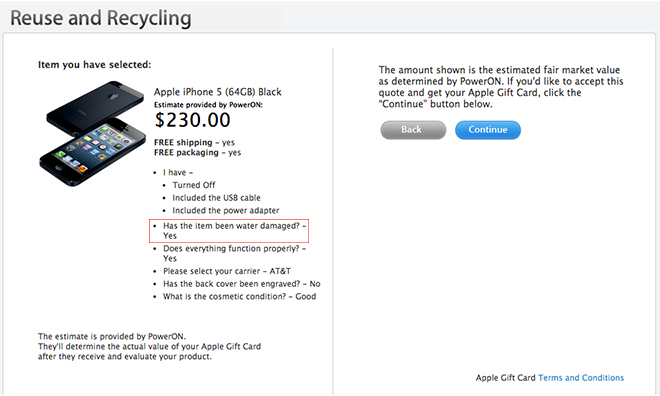 Until the recent policy revision, however, devices with liquid damage were not accepted. As noted on Monday, Apple's has lifted that particular restriction, though signs of liquid contact can substantially detract from a device's value. For example, a good condition 64GB black iPhone 5 tied to AT&T would fetch $350 without water damage. With water damage, the same model drops down to $230. The lower price is to be expected, as recyclers are taking a risk in buying back a damaged item. Apple points out that customers can assess their own devices by checking a liquid contact indicator usually located in the bottom of the headphone jack. If activated, the normally white or silver tab will show a red or pink color. The indicator is positioned on the bottom of the dock connector housing for the iPhone 3G and later, as well as all iPads. An exception is the iPhone 5, which has the indicator placed in the SIM card tray. Apple first debuted the Reuse and Recycling Program in 2011 and offers Apple Store gift cards instead of cash for used products.